The Chevy TrailBlazer is among the best of the truck-based midsize SUVs. It's capable of hauling heavy loads and negotiating rugged off-road terrain. Yet it's also smooth, comfortable and civilized. These are benefits of its rigid chassis, sophisticated suspension, and powerful brakes. Curtain-style side-impact airbags with a rollover sensing system are available for increased head protection. For 2006, GM's excellent StabiliTrak electronic stability control system comes standard across the TrailBlazer lineup. StabiliTrak helps drivers maintain control by reducing or eliminating skidding in emergency handling situations. 2006 TrailBlazer models have been upgraded with a revised brake system designed for improved responsiveness along with sound-deadening measures designed to reduce noise. The TrailBlazer is stable and maneuverable. It handles washboard surfaces well, a nice benefit on unpaved roads. The TrailBlazer is also quite capable off road when equipped with its sophisticated four-wheel-drive system and optional skid plates. The extended-wheelbase TrailBlazer EXT adds substantial cargo space and seven-passenger seating, but it's longer than a Tahoe, and we prefer the standard TrailBlazer for its superior handling and stability. TrailBlazer comes standard with a superbly smooth and modern Vortec 4200 inline six-cylinder engine, which has been upgraded for 2006, and it's our first choice unless towing is a big part of the picture. The Vortec 5400 V8, with its Displacement on Demand technology promising improved fuel economy is available as an option on all 2006 TrailBlazer models. Equipped with the V8, a 2WD TrailBlazer EXT can tow up to 7,000 pounds. A new TrailBlazer SS has joined the line-up for 2006, featuring the 395-horsepower, 6.0-liter LS2 V8 derived from the Chevy Corvette, along with a sport-tuned suspension and competition brakes. The SS gets unique exterior and interior trim and is available with all-wheel drive. Chevy TrailBlazer comes in two trim levels, LS ($26,700) and LT ($29,115). Each is available in regular and EXT extended wheelbase lengths. The long-wheelbase EXT LS ($28,320) and LT ($30,520) are stretched 16 inches between the front and rear wheels to provide a third row of seats for seven-passenger capacity and more cargo room. Four-wheel drive is available on all models ($2,250). The base engine for all TrailBlazers is the 291-horsepower Vortec 4200, a 4.2-liter inline-6. The Vortec 5300 5.3-liter overhead-valve V8, rated 300 horsepower and 330 pound-feet of torque, is now available as an option ($1500) on both the standard and EXT models. All come standard with a four-speed automatic transmission. The TrailBlazer SS ($32,890) comes with GM's LS2 6.0-liter V8 engine, which produces 395 horsepower and 400 pound-feet of torque. Chevy claims the SS can go from 0 to 60 mph in 5.7 seconds. The SS is equipped with a heavy-duty version of GM's four-speed Hydra-Matic automatic transmission, the 4L70E, and is available with two-wheel drive and four-wheel drive. For added safety, GM's StabiliTrack electronic stability control system is now standard on all TrailBlazer models. This system uses a full range of motion and control sensors, coupled to actuators on the throttle and individual wheel brakes to sense and mitigate any unintended changes in vehicle direction. Other safety features include dual-stage driver and passenger airbags, which inflate with less intensity in slower crashes. An enhanced passenger safety belt reminder is standard as are pretensioners on the outboard front-seat belts, that tighten to take up slack when the air bags deploy. Side-impact head-curtain airbags are optional ($495). The optional OnStar system includes GM's Automatic Crash Notification System to transmit crash scene data automatically to participating 911 emergency systems. LS models are nicely equipped with dual-zone air conditioning, CD player, reclining bucket seats and floor console, power windows and programmable door locks, tilt steering, four-wheel disc brakes with ABS, 16-inch aluminum wheels, luggage rack roof rails, and three power outlets. An optional package ($1,185) adds remote keyless entry, content-theft alarm, heated foldaway mirrors, a rear window defogger, color-keyed carpeted floor mats, crossbars for the luggage rack, and Charcoal-colored body-side moldings. LT adds fog lamps, an overhead console with HomeLink transmitter and Travelnote digital recorder, body-color grille and door handles, eight-way power for the driver's seat, a trailer wiring harness and 17-inch aluminum wheels. Two-tone leather seating surfaces, a leather-wrapped steering wheel, and dual front eight-way power reclining bucket seats with adjustable lumbar support are available as a package ($1,180). The front and rear fascias, grille, headlamps, rocker panels and body side moldings on the LT have been revised for 2006 to give the upscale model a more distinctive appearance. TrailBlazer EXT LS and TrailBlazer EXT LT are equipped similarly to their standard-wheelbase counterparts, but add third-row seating plus separate rear-seat heating and air conditioning controls. EXT LS models come standard with a HomeLink transmitter, fog lamps, 17-inch wheels, and other upgrades. TrailBlazer's styling helped blaze the trail for the latest Chevy Truck design. It's an aggressive look with bold headlamps and a split grille. The horizontal bar that splits the grille, headlamps and turn signals is chromed on the LS, body-colored on the LT, and black on the SS. The front bumper features a large opening with two vertical slats, and the optional foglights are mounted down low. The front end of the TrailBlazer makes it look like a scaled-down Suburban or Silverado. Overall, TrailBlazer looks neat and sturdy, with confident lines that express utility. The pillars and window lines are graceful, while the big fender flares are visually bold. At the rear is a convenient step in the center of the bumper. The seven-seat TrailBlazer EXT is 16 inches longer between the front and rear wheels than the standard five-seat TrailBlazer and looks disproportionately long and narrow. The easiest way to tell the TrailBlazer from the TrailBlazer EXT is to look at the rear passenger doors; they're full-size doors on the EXT but the rear wheel wells cut into them on the standard-length model. For 2006, the antennas for the optional OnStar assistance system and XM Satellite Radio are combined in a single unit. The Chevy TrailBlazer's cabin is comfortable and convenient. Seats on the LS are manually adjustable. Eight-way power operation with memory and seat heaters is available on LT models. Power adjustable pedals on the LT allow shorter drivers to move the brake and accelerator pedals up to three inches closer for better positioning and comfort without having to move too close to the airbag-equipped steering wheel. It's a good safety feature and popular among women. The TrailBlazer seats five, the TrailBlazer EXT seats seven. Second-row space is nearly identical between TrailBlazer and TrailBlazer EXT. First and second row hip and leg room is comparable to the Ford Explorer, though the TrailBlazer does offer an inch more headroom throughout the cabin. Cargo space in the EXT is generous. Fold the second- and third-row seats and TrailBlazer EXT offers 107 cubic feet of packing room, more than the TrailBlazer (80), Ford Explorer (86), and comparable to the full-size Chevy Tahoe (105). The cargo floor isn't as flat as we'd like, though, and a gap between the two third-row seats makes it less dog-friendly. Space in the EXT third-row seats, is a bit cramped, as it is with most third rows. The Explorer has more third-row legroom. Also, we put some an adult and a teenager back there and they complained about tunnel vision. Up front, the driver gets complete and clean instrumentation. Heating and air conditioning can be controlled separately by the driver and front-seat passenger. EXT models add separate climate controls for rear-seat passengers as well. Interior lights abound, including reading lights. Optional on the four-spoke, leather-wrapped steering wheel are handy buttons for climate, audio, cruise control, and the driver information center. The center console includes an open storage bin, an enclosed compartment and two cup holders forward of the gear lever plus two cup holders for the rear passengers. There are pockets in the front doors and behind the front seats, though none in the rear doors. Behind the rear seat is a small hidden compartment under the floor. A cargo net, a scrolling tonneau cover, and power outlets are available. An overhead console on the LT includes a sunglasses holder plus Travelnote digital recorder. For 2006, Chevy TrailBlazers get an enhanced sound-mitigation system, including an acoustic windshield to minimize wind noise, and additional sound insulation within areas of the body that can transmit engine and road noise. Safety is improved from the available head-curtain side-impact airbags, which unfold from the roof rail between the A-pillar and side window header. When the bag deploys in a moderate-to-severe side impact, it is angled somewhat toward the window to help provide protection for front and rear outboard passengers. The 2006 system replaces the previous seat-mounted system, which protected the driver and front-seat passenger only. TrailBlazers equipped with head-curtain airbags also feature a new rollover sensing system that triggers both the side-curtain airbags and safety belt pretensioners. The rollover-sensing module uses a complex algorithm based on lateral and vertical accelerations, roll rate and vehicle speed to determine whether to deploy the safety systems. GM's Passenger Sensing System (PSS) is standard on the TrailBlazer, which deactivates the front-passenger airbag if it senses an unoccupied front passenger seat or the presence of a smaller occupant. A status indicator on the instrument panel alerts occupants that the passenger airbag is on or off. Even with this system, however, we strongly recommend carrying under-age passengers in an appropriate child seat placed in the second or third row of the vehicle. 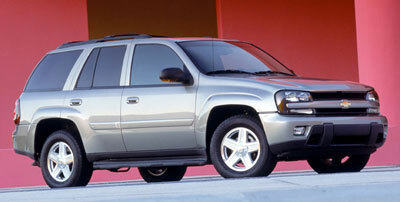 TrailBlazer's six-cylinder 4.2 liter engine, called the Vortec 4200 is smooth and quiet. The faster it goes, the smoother it seems to get. It's an inline-6, a design that's inherently better balanced than a V6. It idles so smoothly that Chevy Truck added a device that prevents the starter from grinding if the key is turned when the engine is already running. The six-cylinder engine features dual overhead camshafts, four valves per cylinder, and variable phasing of the exhaust cam. It's been upgraded for 2006 to produce 291 horsepower and 277 pound-feet of torque. (Torque is that force that thrusts you off the line and up steep hills.) Ninety percent of the peak torque is available at just 1600 rpm and it's still there at 5600 rpm. The engine is still striding, not screaming, when the full-throttle upshift comes at 6000 rpm. That torque gave us confident power when attempting passes on steep uphill two-lanes. It offers strong acceleration without forcing the transmission to downshift. The four-speed automatic transmission is programmed well and makes a good companion for the engine. Shifts are smooth. Towing was a high priority in the TrailBlazer's engineering. Six-cylinder models are rated to tow 6300 pounds with 2WD, 6100 with 4WD. Even the EXT powered by the six-cylinder engine can haul 5800 pounds with 4WD. The six-cylinder engine is designed to run cool while towing, thanks in part to a big seven-quart oil pan. Big ventilated disc brakes provide stopping power, and four-wheel ABS is standard. Under hard braking, the nose didn't dive, keeping the TrailBlazer remarkably level and stable. Braking capability has been improved for 2006 with a new low-drag caliper system with a more responsive brake booster and larger master cylinder for improved pedal feel, a system first introduced on SS models. We found the ride excellent, very smooth without being too soft. The TrailBlazer was designed to lean a maximum of only 5 degrees in corners. It features a wide track and low engine position, which drops the center of gravity. A vehicle with a low center of gravity is generally less likely to roll over than a vehicle with a high center of gravity. TrailBlazer has a very tight turning circle of 36.4 feet, because the suspension and engine design allow for large steering angles, a real plus in crowded parking lots. The chassis and suspension are highly developed with design features normally associated with sports cars: rack-and-pinion steering, four-wheel vented disc brakes with twin-piston calipers in front, independent front suspension with short/long control arms, live rear axle using five-link location with Bilstein gas-charged shock absorbers and coil springs, and thick antiroll bars front and rear. The chassis rails are shaped by hydroforming, which makes them stronger and lighter. No less than eight crossmembers contribute to TrailBlazer's torsional rigidity, and there are 12 tuned body mounts that use rubber pads and hydraulics to dampen vibrations. We found the TrailBlazer impressively stable on washboard surfaces. It bottomed on dips, however, signaling that the optional skid plates are necessary for off-road driving. When equipped with the 17-inch on/off-road tires and skid plates, the TrailBlazer easily chugged along at 5 mph through soft sand in Auto4WD. Four-wheel-drive TrailBlazers feature GM's Autotrac system, which offers four settings: 2WD, Auto4WD, 4HI and 4LO. Switching in and out of 4WD can be done on the fly with a flip of a switch. The transmission must be in neutral to engage or disengage 4LO. In Auto4WD, power is shifted to all four wheels as conditions require. The TrailBlazer can be towed in the Auto mode without having to disconnect the driveshaft, a convenient feature. Traction control is available for 2WD TrailBlazers. Chevy TrailBlazer sports a nice design and a well-executed interior. Smooth, stable, and powerful, TrailBlazer works well around town, on the open highway, and in the back country. Almost none of that applies to the long-wheelbase TrailBlazer EXT, however, which surrenders much of the standard model's ride and handling for extra cargo space but barely adequate third-row seating capacity. NewCarTestDrive.com correspondent Sam Moses filed this report from the Columbia River Gorge, with Mitch McCullough reporting from Los Angeles. Head/hip/leg room, f: 40.2/56.0/42.9 in. Head/hip/leg room, m: 39.6/58.2/37.0 in. Head/hip/leg room, r: 80.1 in. Cargo volume: 80.1 cu. ft.